Narrator: Before Jesus returned to Heaven to sit at God's right hand, He promised that the Holy Spirit would come, and that the Spirit would teach the disciples everything they needed to know. 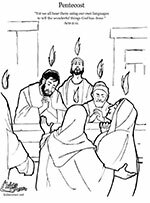 What was it like the day that the Holy Spirit came? In this story from the New Testament book of Acts, we'll hear what happened as God fulfilled that great promise. Disciple 2: It's been ten days since Jesus left us. We have all been in hiding. Disciple 3: He told us to wait for the Holy Spirit to come. Disciple 4: What form will it take? When will it come? Disciple 1: Jesus told us that all we have to do is ask. Disciple 3: Yes, but I've been praying constantly for the Holy Spirit to come, and nothing has happened. Disciple 4: This waiting has been difficult. All: Hallowed be your name. Narrator: Suddenly there was a noise from heaven like the sound of a mighty wind! It filled the house where they were meeting. Then they saw what looked like fiery tongues moving in all directions, and a tongue came and settled on each person there. The Holy Spirit took control of everyone, and they began speaking whatever languages the Spirit let them speak. Disciple 1: (Shouting over the wind. different language one) Jesus is the Messiah predicted from the prophets! Disciple 2: (shouting over the wind. different language two) He was crucified but rose from the dead. Disciple 3: (shouting over the wind. different language three) Jesus is the Messiah! Disciple 4: (shouting over the wind. different language four) I saw him crucified, but he rose from the dead. Disciple 1: (shouting over the wind. different language one) Praise be to God! Disciple 2: (shouting over the wind. different language two) Fellow Jews and all who live in Jerusalem, Jesus is the Messiah. Disciple 3: (shouting over the wind. different language three) I will show wonders in the heavens and signs on the Earth. Disciple 4: How could we have spoken those languages? Disciple 1: The Holy Spirit. He is with us! Narrator: Many religious Jews from every country in the world were living in Jerusalem. And when they heard this noise, a crowd gathered. But they were surprised, because they were hearing everything in their own languages. The Holy Spirit gave Peter the power to speak a great message telling everyone who listed about who Jesus is. Peter proclaimed the Good News. And 3000 people came to the Lord that day. If you would like to read more about Peter and the early church, check out the New Testament book of Acts.